Monday, September 10th saw the dedication of the new gym floor at St. Anselm Catholic Academy. The renovation work was made necessary by the fact that over the more than eighty years that the floor had been down, it had developed ‘dead spots’, making it difficult for play. The celebration was the culmination of months of planning and activity by Saint Anselm Youth Activities, Saint Anselm Catholic Academy, the Home Academy Association, and the Academy’s Fathers’ Club. Youth Activities President, Jim Condon, who conducted the evening’s program, noted that the renovation was possible, not only because of the combined efforts of parish and academy organizations, but also because of the many volunteers who contributed their time, labor and skills to make the project a success. Msgr. Maloney, who gave the benediction, thanked the individuals and organizations, who contributed to the project. Bob Fugowski, Saint Anselm Catholic Academy Board member spoke on behalf of John Quaglione, President of the Board, who was unable to attend. Bob presented the ‘demolition’ volunteers with inscribed keepsakes made from pieces of the floor and some of the more than 45,000 nails removed during the work. 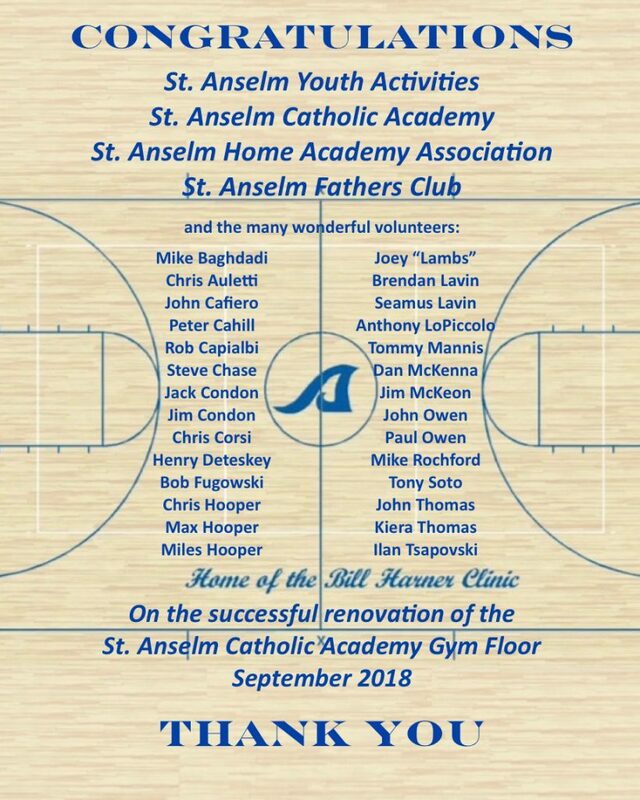 While noting that there were so many individuals to thank, Jim particularly mentioned: Monsignor Maloney for his trust and support that the renovation would be successfully completed; Seamus Lavin, a great friend to the St. Anselm community, for his countless hours given over the summer months; Bob Fugowski, SACA Board member, 76 years young, who borrowed his son’s truck to deliver materials and did demolition work, John Cafiero, who with an electrician, helped with swapping out the old electrical fixtures, Jim McKeon, the Academy’s outgoing Principal, who not only worked on the demolition – but, also kept the crew supplied with pizza, and the SACA adult B Ball buddies, who generously support SACA each season, and – particularly the nine B Ball guys who gave their time to the project. A key part of the successful renovation was the decision that volunteers would handle the demolition work of the project. There was a special thank you for the youngest volunteers: Kiera Thomas, age 10, Max & Miles Hooper, who joined their dad, Chris, and alumni Jack Condon and Brendan Lavin. The work of the nearly 30 volunteers saved the project over $18,000.00. Jim thanked Cono Dalera, from the parish, and Fran Kelly from the Academy for their assistance in maintaining the building. He thanked Stephanie Kearney, the Concession “Commish”, for making sure needed supplies were on hand and Anne Texiera, for her work in preparing the video. Jim welcomed the family of Bill Harner. He noted that Bill is missed but that the values of passion, commitment and persistence that he taught continue. Kris Harner, Bill’s daughter, concluded the evening’s program – speaking movingly about her father’s love of sport, particularly basketball, and the St. Anselm community. As Kris finished her words the floor inscription: “Home of the Bill Harner Clinic”, was unveiled. The evening concluded with Jim saying: Saint Anselm Youth Activities is all about the kids and instilling values that they can carry with them throughout their lives.